« Ever Fallen For The Buzzcocks? Expect a ‘faster and louder’ show at the Bleeding Kansas Festival. Elvis Costello, Atlantic Records, Franz Ferdinand and Lollapalooza have at least one thing in common: Death Cab for Cutie. The Seattle band had been building a loyal fan base since 1998 when last year it signed to Atlantic Records and released the album “Plans.” The fans rejoiced when the big label association didn’t alter the music. In fact, the band wasn’t done pushing its core conceptions. Walla and the rest of the band — singer, guitarist and chief songwriter Ben Gibbard, bassist Nick Harmer and drummer Jason McGerr — are headlining the Bleeding Kansas Arts & Music Festival at Burcham Park in Lawrence on Saturday. The steamy outdoor setting isn’t ideal for “Plans,” an album best suited for rainy afternoons indoors. The more popular Death Cab gets, however, the more it plays in places that serve thousands of fans than it does intimate clubs. 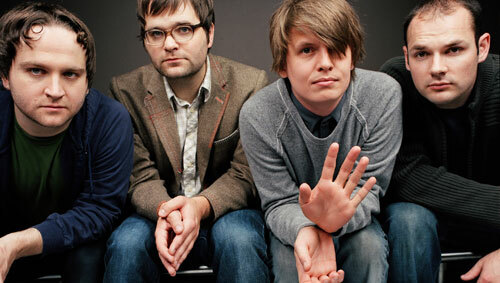 In June, Death Cab played Bonnaroo; Friday the band plays Lollapalooza in Chicago. In both places, Walla said, the band will adjust. That’s not the only adjustment fans have had to make. It recently toured with Franz Ferdinand, whose frenetic disco rock is the complete opposite of Death Cab’s introspective, mellow sound. The bands were already mutual fans and quickly embraced the idea, alternating opening and closing nights. Death Cab recently performed with Elvis Costello for VH1’s televised “Legends” concert. In the end, “Accidents Will Happen” and “Kinder Murder” won out. So what are the consequences of all this mingling with strange bedfellows and playing huge festivals? For a band that has been as adventurous as Death Cab has been lately, static is a new direction.